Installed within a factory originally from 1907, its tradition is the basis for modern production technologies, which are constantly up-dated. Our processing factory in Rio Cuarto (Córdoba) has a milling capacity of 120 tons of corn per day and a storage capacity of 10000 tons of corn. 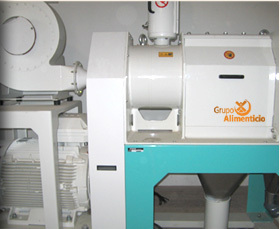 The company owns modern equipment supplied by Buhler from Switzerland. It has last generation environment control systems that reduce the emission of contaminating particles. Our factories and logistics centers are located in strategic places throughout Argentina making the transportation of our goods quicker. These characteristics and the fact that we are in the center region, the most important production area in the country, makes us the most sensible choice in the international market.